Sam Burgess does not have the game-management and experience to play centre at the World Cup, according to 2003 World Cup winner Matt Dawson. England boss Stuart Lancaster says the uncapped Burgess is being viewed as a centre at the World Cup training camp. However, while the ex-rugby league international, 26, started his union career in midfield for his club Bath, he has since moved into the back row. "He's been found out playing for Bath in that midfield," Dawson said. The former scrum-half, who won 77 England caps as well as seven for the Lions, said on Matt Dawson's Rugby Show on BBC Radio 5 live: "Stuart Lancaster has said [Burgess has] power, skill, agility, defence. No question there. "Lancaster didn't talk about reading the game, game-management, analysis, positioning. Burgess hasn't got it. "When he's been in the forwards he's been a real threat." Despite being prominent in recruiting Burgess, the Rugby Football Union opted not to pay the fee to release him from his contract with South Sydney, which would have given them greater influence to choose his club position. Dawson feels this has stunted Burgess' development. "I feel for Sam," Dawson said. "If he had the coaching from both England and Bath and nailed down a position he would be a lot further down the line. "You can't take him to the World Cup just because he's good for morale." With Brad Barritt and Jonathan Joseph almost guaranteed places in England's 31-man World Cup squad, the likes of Burgess, Henry Slade, Billy Twelvetrees, Kyle Eastmond and Luther Burrell are competing for the other centre spots. 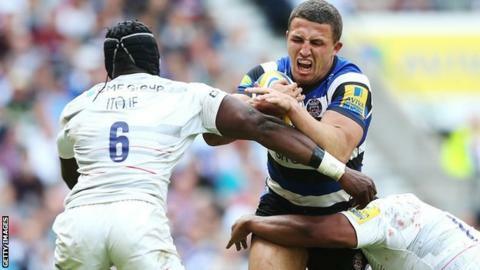 "Burgess is clearly a special human being but for him to go, there are some serious players not going," said former England and Bath prop David Flatman. "He does have the mindset and the genetics to have a massive impact on rugby union at the highest level. I do not believe that is at centre." Burgess is set to feature in one or both of England's warm-up matches in August - against France at Twickenham on 15 August and then in Paris a week later - before the 31 August deadline for final squad selections. England have a final warm-up match against Ireland on 5 September before the tournament opener against Fiji at Twickenham a fortnight later. Listen to a podcast of Matt Dawson's Rugby Show.